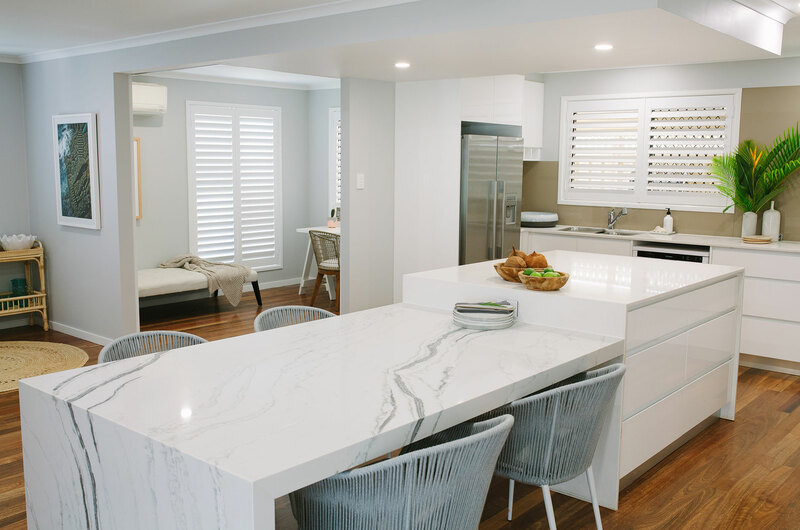 The first episode of Love It Or List It Australia Season 2 featured the renovation of a family home in Boondall QLD that showcased Smartstone quartz surfaces in the kitchen and bathroom. Hosted by the team of style guru Neale Whitaker and property professional Andrew Winter, Love It Or List It Australia is a TV series that follows home owners who are struggling to make the decision to renovate and “love” their home or sell it up and find an ideal home elsewhere. Guided by the design brief, the project team led by Arki Haus Head Designer Luisa Klinge opened up the living area and reoriented the kitchen to create more space for the family. Rotating the island bench created a streamlined look and more space for cooking and dining. The new kitchen orientation made the wasted space in the once living room become a usable area for family life. 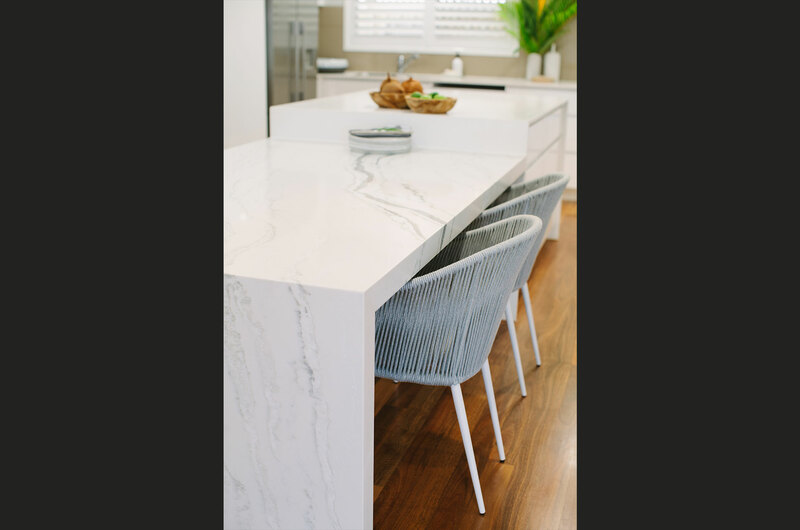 A separate dining room was no longer required so a Smartstone quartz surface, Smartstone Bianco Molasa, was installed as the new dining table section which allowed for more seating. Streamlined with a 50mm apron edge, the vein is perfectly grain matched on every edge. The waterfall end panel shows off the gorgeous Molasa grain. From the special collection, Bianco Molasa is a versatile and elegant surface with dramatic black veining on a white background. “The stunning new Bianco Molasa was chosen because of the white background and the grain of charcoal. Sand tones reflected the Coastal Style we were inspired to create throughout the renovation. Molasa almost looks like sand dunes, so it was the natural choice,” said Luisa. “We loved how the vein almost resembled a wave. 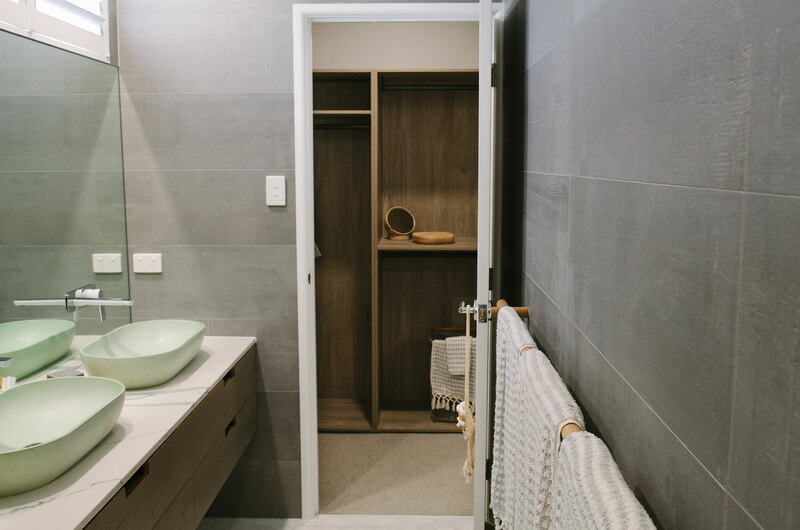 It was the perfect choice as we were looking to achieve a coastal vibe in this renovation using natural colours and textures,” added Arki Haus interior designer Claudia Arnold. Light sandy, white and grey tones where used throughout the home in paint, finishes and furnishings to bring in the coastal feel the homeowners loved. 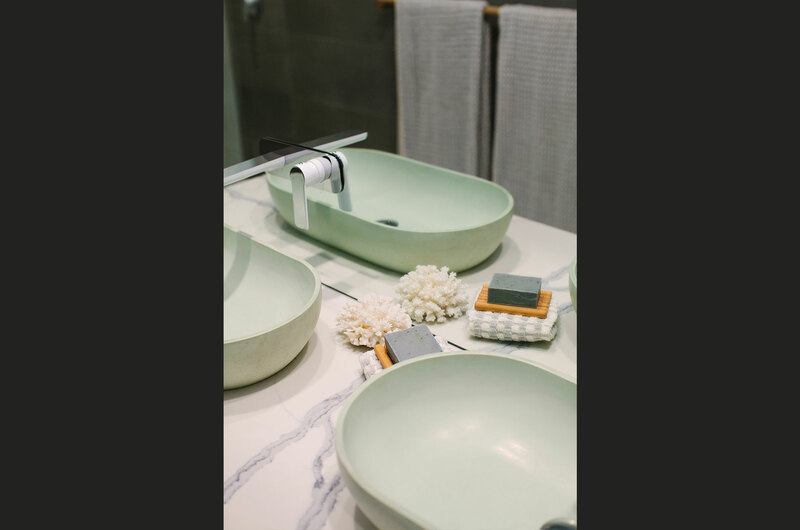 For the ensuite bathroom, the design team used Smartstone Statuario Venato for vanity surfaces to keep the ensuite light and fresh as the tiles were white and grey. 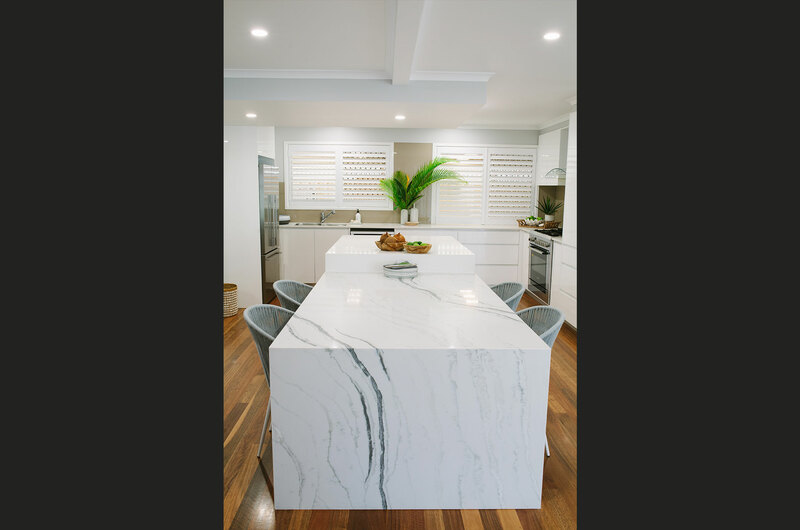 Claudia said Statuario Venato is the perfect mix of the two colours without being too overpowering. 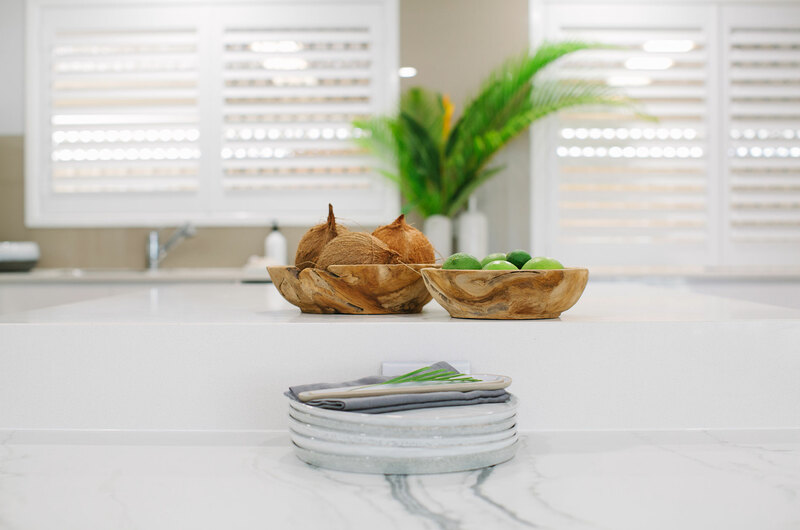 “We loved using Smartstone in this renovation because it perfectly complimented all the interior finishes both existing and new. Mainly white colour palette with touches of sand, stone and charcoal teamed with blues in the styling to bring a relaxed and light feel to the entire home. 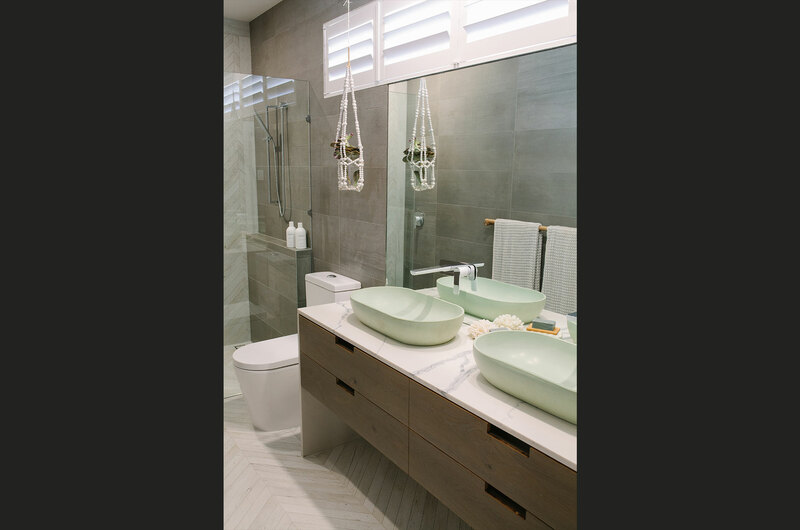 The home felt larger, brighter and the energy flowed freely with the new space,” said Luisa. 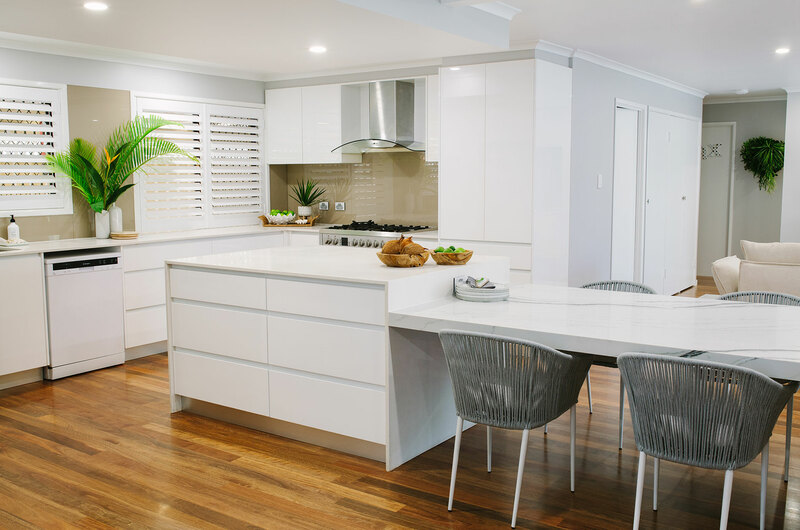 At the end of the episode, the revamped tropical house in Boondall won the hearts of the couple who decided to love and stay in their new spacious home. The episode was aired on 26th September on the Lifestyle Channel on Foxtel. Know more about the Boondall home on Love It Or List It Australia Series 2, Episode 1.